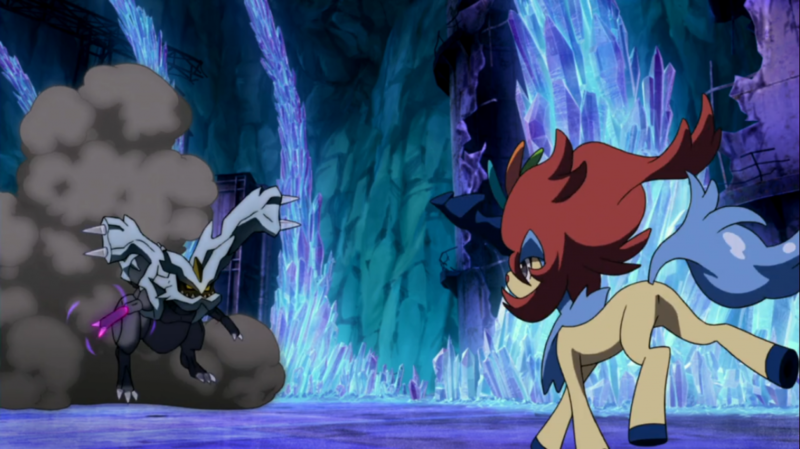 Kyurem and Keldeo face off! Will Keldeo be stopped cold in his tracks by Kyurem’s overwhelming power? Pokemon the Movie: Kyurem vs. The Sword of Justice, titled 「キュレムVS聖剣士ケルディオ」(lit. “Kyurem VS Sacred Swordsman Keldeo”) in the original Japanese release, is the 15th entry in the Pokemon movie franchise. Japanese theaters premiered this film on July 14, 2012 while American audiences watched the film for the first time through Cartoon Network on December 8, 2012. Astute fans might notice that Kyurem VS Sacred Swordsman Keldeo (hereby Kyurem) did not follow the same distribution pattern that Victini and the Black/White Hero – Zekrom/Reshiram did in which there were multiple versions of the film. Whether due to poor box office sales, fan backlash, or strained production is unknown. Will the renewed focus on a single film production cycle for Kyurem culminate in a stronger plot than we saw in Victini? Let’s go and see! The film begins with the titular Pokemon, Keldeo, training with a trio of Pokemon referred to as the Sacred Swordsmen. One by one, Keldeo challenges each of the Sacred Swordsmen, Virizion, Terrakion, and Cobalion to a duel. Each of the Sacred Swordsmen possess the ability to use the technique known as Sacred Sword, an ability to project a blade of energy from their horns. Keldeo, despite his best efforts, cannot summon a sword of his own and ends up losing each of these duels. Impatient prove himself worthy, Keldeo demands that Cobalion, their leader, grant him the opportunity to fight against the Dragon-type Pokemon known as Kyurem. A battle with Kyurem is a rite of passage one must take in order to become a Sacred Swordsman. However, Cobalion refuses saying that Keldeo has not yet learned the “weight of a sword.” Frustrated that Cobalion refused his request, Keldeo sneaks away to battle Kyurem in the middle of the night while the rest of the Sacred Swordsmen slept. Keldeo heads to the abandoned mine in which Kyurem resides. As Keldeo approaches the bottom floor, Kyurem calls out asking who intrudes on his territory. Keldeo lies, and declares that he comes to fight Kyurem as a Sacred Swordsman. Intrigued, Kyurem lumbers out from his chamber into the open area at the bottom of the mine. There, Kyurem sets up an arena surrounded by ice and warns Keldeo that once Keldeo passes the threshold, they will fight to the death. Confidently, Keldeo steps towards Kyurem, initiating the battle. The Sacred Swordsmen meanwhile realize that Keldeo went missing and fear the worst as they rush towards Kyurem’s lair. They find Keldeo and Kyurem fighting, Keldeo with his back to the ropes doing all he can to resist Kyurem’s attacks. In desperation, Keldeo tries to attack Kyurem with his horn, but without the power of the Sacred Sword, Keldeo’s horn shatters against Kyurem’s attacks. Realizing how far out of Kyurem’s league Keldeo is, the Sacred Swordsmen plead with Kyurem to let Keldeo go. Angered at their interference, Kyurem encases them in a block of solid ice. Finally at the breaking point of fear, Keldeo desperately flees the arena, with Kyurem and his army of Cryogonal in pursuit. Keldeo eventually stumbles down a hillside and lands on top of a train moving towards Roshan City. Satoshi (Ask Ketchum), Iris, and Dent (Cilan) are riding this very train and find Keldeo on the roof of one of the carriages badly injured and quaking with fear. As the train moves on, Kyurem eventually tracks down Keldeo and attacks the group on the train until the train disappears inside of a tunnel, forcing Kyurem to give up his pursuit. Satoshi and his friends take Keldeo to the Pokemon Center in Roshan City, where Keldeo is patched up and made good as new, save for his horn which remains broken. Satoshi manages to win Keldeo’s trust enough to have Keldeo explain his situation. 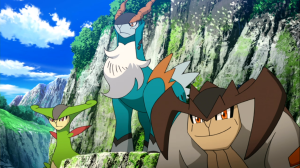 Keldeo tells the group everything about Kyurem and the Sacred Swordsmen and the group decides to help Keldeo rescue his comrades. Kyurem and his army of Cryogonal find the group however and attack them in the middle of Roshan City. They manage to escape to the underground rail tunnels which eventually lead them to an old train museum. There, they decide to split into two groups in order to throw off Kyurem and the Cryogonal army. Iris leaves first and acts as a decoy flying a blimp, while Satoshi, Dent, and Keldeo ride off in a tram cart towards Kyurem’s mine. Dent splits off later as well, leaving Keldeo and Satoshi to walk the rest of the distance on foot while Dent and Iris distract Kyurem. Keldeo mulls over Iris and Dent’s selflessness wondering why these three are going to such lengths to help him. As they get closer to Kyurem’s lair, Keldeo begins to quiver once again in fear and loses the will to go onward. Satoshi decides to go on and promises Keldeo that he will free the Sacred Swordsmen. Satoshi finds the frozen Sacred Swordsmen and works frantically with his Pokemon to free them, but Kyurem returns quicker than anticipated. Right before Satoshi eats one of Kyurem’s attacks, Keldeo arrives on the scene and once more challenges Kyurem to a fight to buy Satoshi time. This time, Keldeo fights Kyurem with more tact, remembering everything he learned while training with the Sacred Swordsmen. Eventually, Satoshi, joined by Iris and Dent, free the Sacred Swordsmen. Seeing that his friends are safe, Keldeo gets a burst of courage and finally manages to not only use the technique Sacred Sword, but transforms into his “Resolute Form.” Now bearing the strength to fight Kyurem on even ground, Keldeo and Kyurem resume their battle. However, a wayward attack from Kyurem finds its way towards the Sacred Swordsmen and Satoshi’s group. Seeing his friends in danger, Keldeo rushes to block the attack before his friends get hurt. 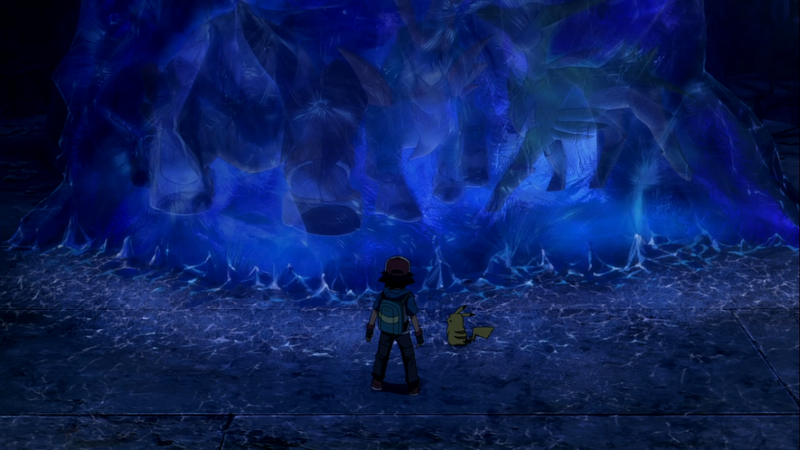 The damage from this attack turned out to be too great, and Keldeo is knocked down, Kyurem looming above him. Keldeo acknowledges his defeat, preparing for Kyurem to finish him off. Kyurem instead praises Keldeo for choosing the safety of his companions over the result of the duel. Kyurem tells Keldeo that he will make a fine Sacred Swordsman and returns once more to his lair, awaiting the next challenger. With the Sacred Swordsmen free, Keldeo takes the oath of the Sacred Swordsmen and finally joins their ranks as a fourth member. 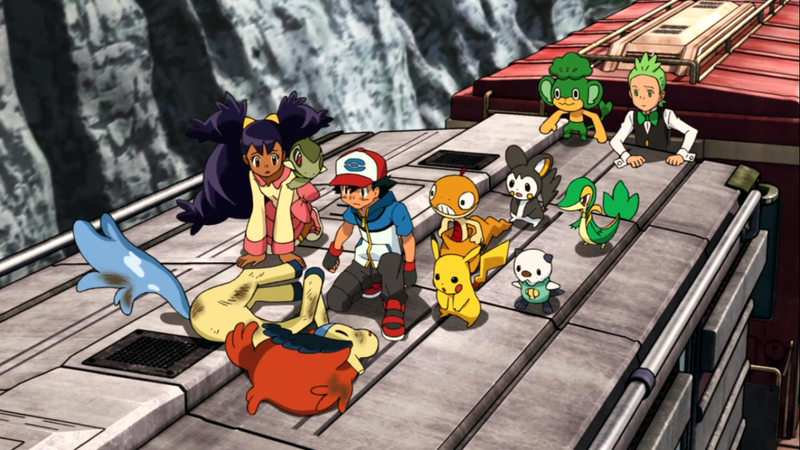 The group part ways as Satoshi and his friends continue on their adventure. The Sacred Swordsmen that Keldeo trains together with. From left to right, Virizion, Cobalion, and Terrakion. Kyurem‘s plot mixes together two classic literary story lines. It’s the run-of-the-mill tale of a hotheaded youth (Keldeo) trying to prove himself and in doing so, gets his close companions wrapped up in something dangerous. Then, after some soul searching and reflection upon his naivety, the youth returns to save his compatriots and succeeds thanks to his new-found maturity. This ties together with the parallel story ripped straight from The Three Musketeers in which our youth, with courage and selflessness, proves himself worthy to join an elite and noble trio as a fourth member. While not the most original, it provides a sturdy story steeped in literary tradition that is easily understood and enjoyed. Iris, Satoshi, and Dent discover the injured Keldeo on top of the train carriage on the way to Roshan City. However, it’s a Pokemon series feature film and that means that they unfortunately had to weave in yet another plot thread somehow involving Satoshi and his band of goons. My harshest criticism for Mew and the Hero of the Wave: Lucario was Satoshi’s shoehorned plot. I thought in that film, Satoshi and his band of friends were wholly out of place and stole screen time from the main character, Lucario. My sentiments for Kyurem mirror my sentiments for Lucario almost exactly. Satoshi stuck out in a way that detracted from the film as a whole. Let’s remember that the main star is Keldeo. It’s his blunder that sets all the gears in motion and it’s his growth that is the key focus of the story. Satoshi and his friends cheapened Keldeo’s narrative growth. There are multiple scenes where Keldeo’s breathing become irregular, his knees begin quaking, and his eyes dilate while he remembers Kyurem’s power. Satoshi stands before the Sacred Swordsmen, encased in ice still and soon sets to work trying to free them. But Satoshi magically gives Keldeo the motivation to fight Kyurem once more with no real explanation other than his courage rubbed off on Keldeo. The film should have focused on how Keldeo dealt with his internal turmoil, but instead the camera follows Satoshi into Kyurem’s lair, leaving us to wonder what happens to Keldeo or how Keldeo manages to overcome his fear — potentially compelling threads.This compromise, clearly made to give Satoshi any relevance to this story at all, steals the spotlight from Keldeo’s story and only emphasizes how unnecessary Satoshi is to this particular story. Frankly, this is one of those movies where the series’ insistence on including Satoshi diminishes the fun. In stark contrast to our protagonists, the titular Kyurem fits the story quite well. He’s certainly a step up from Dred from the previous Victini film. Kyurem’s effectiveness as a villain in this film comes from his motivations. Unlike many Pokemon movie antagonists, Kyurem isn’t a caricature of evil and has no dreams of conquest. Rather than a cackling villain, he’s a more believable obstacle for Keldeo to overcome. I rather like that this film had no explicit evil-to-be-defeated. I feel that having one could have easily blown up the basic story of Keldeo’s development to absurd proportions ill-fitting with the end result and goal. 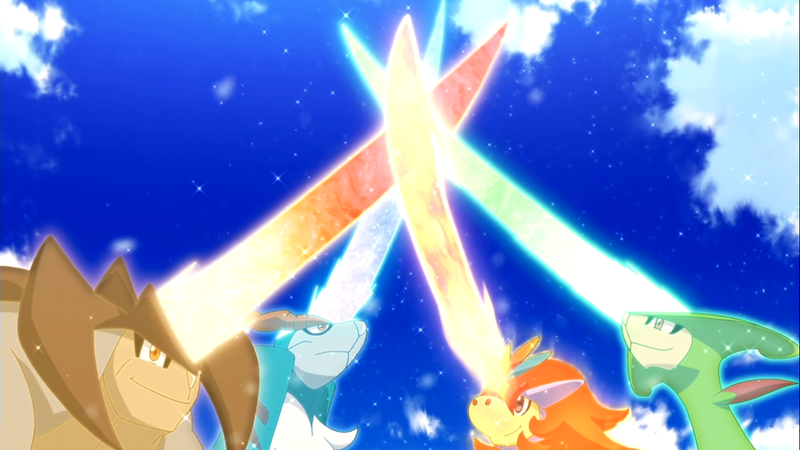 The four Sacred Swordsmen cross their swords together after Keldeo and Kyurem finally settle their score. On the whole, Kyurem ends up a rather mediocre film. It dilutes the narrative with Satoshi and his crew. However, Kyurem’s strong writing is an encouraging development; I’m hoping that the next film, Extreme Speed Genesect: Mewtwo Awakens, weaves our hero Satoshi better into its plot and continues this trend of morally ambiguous antagonists.